This grand antique roll-top desk is crafted in the style of celebrated British maker Donald Ross, and features lustrous parquetry panels and fine ormolu detailing. 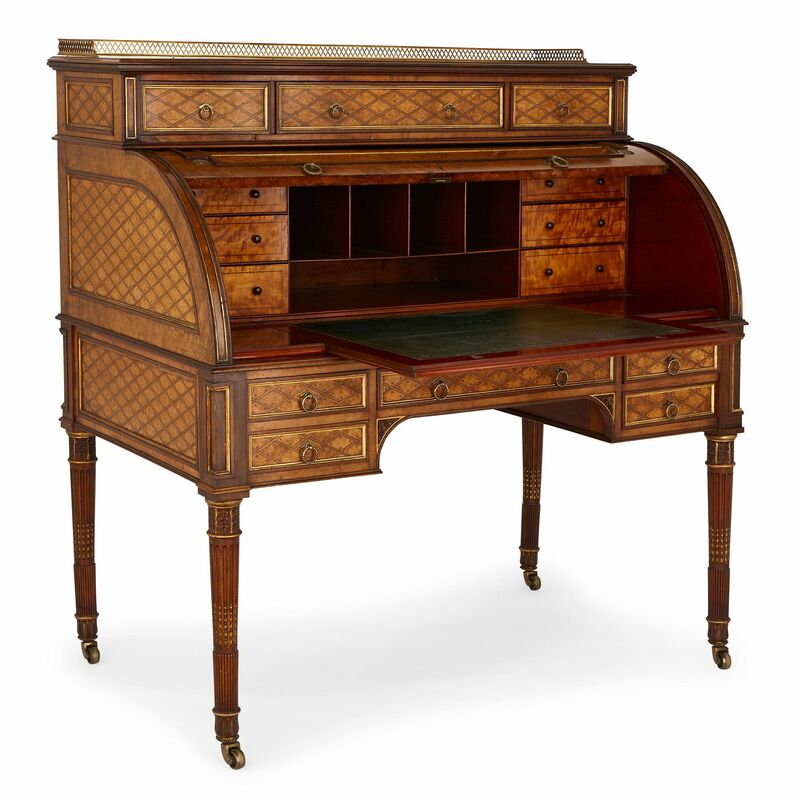 The roll top desk is of typical form, featuring fine walnut, satinwood and rosewood parquetry designs all over. The desk is surmounted by a three-quarter pierced ormolu gallery, and the upper-most section features three drawers to the front, of which the central drawer is the largest. 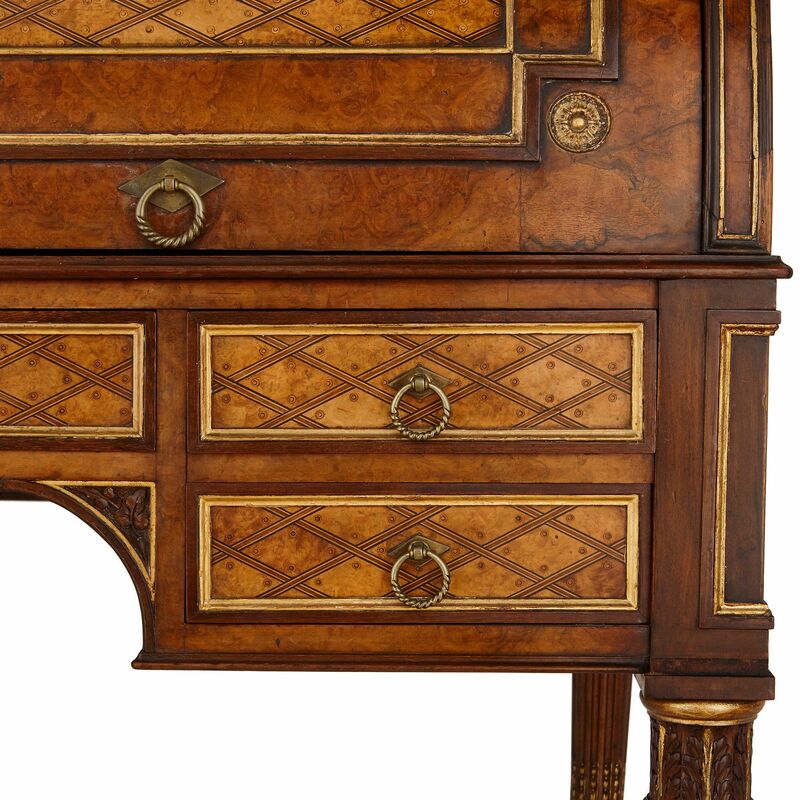 Each drawer is decorated in parquetry, with a diamond pattern, all contained within an ormolu frame. This design feature is repeated on the sides of the desk and to the lower drawers. 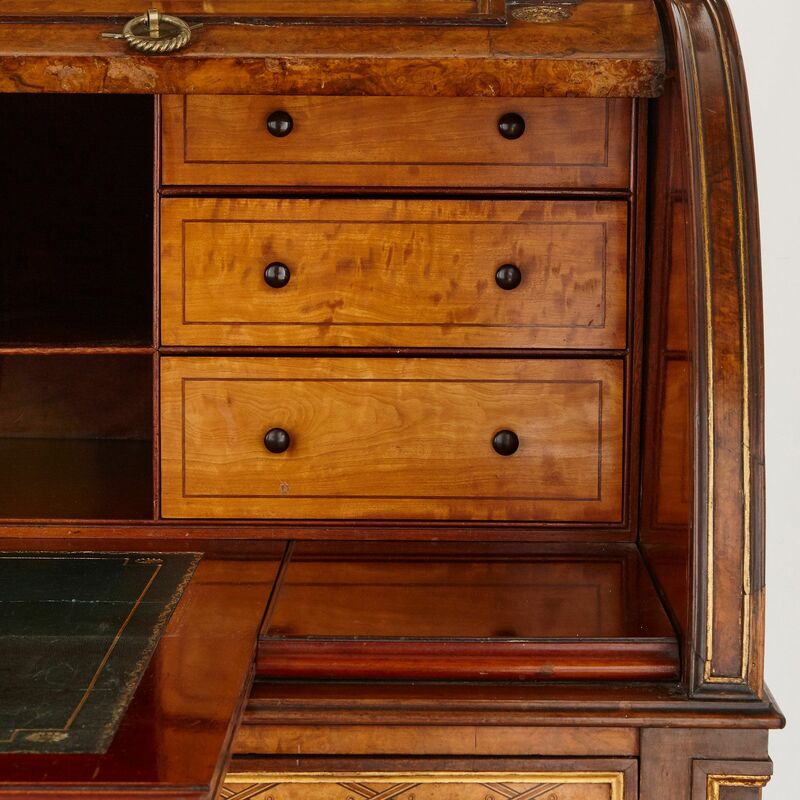 The central, curved section of the desk features a rolling top decorated to the centre in parquetry, below which are set two ormolu rings which allow the top to slide back into the desk. The interior features a leather lined writing slide with six drawers and central pigeon holes to the rear. 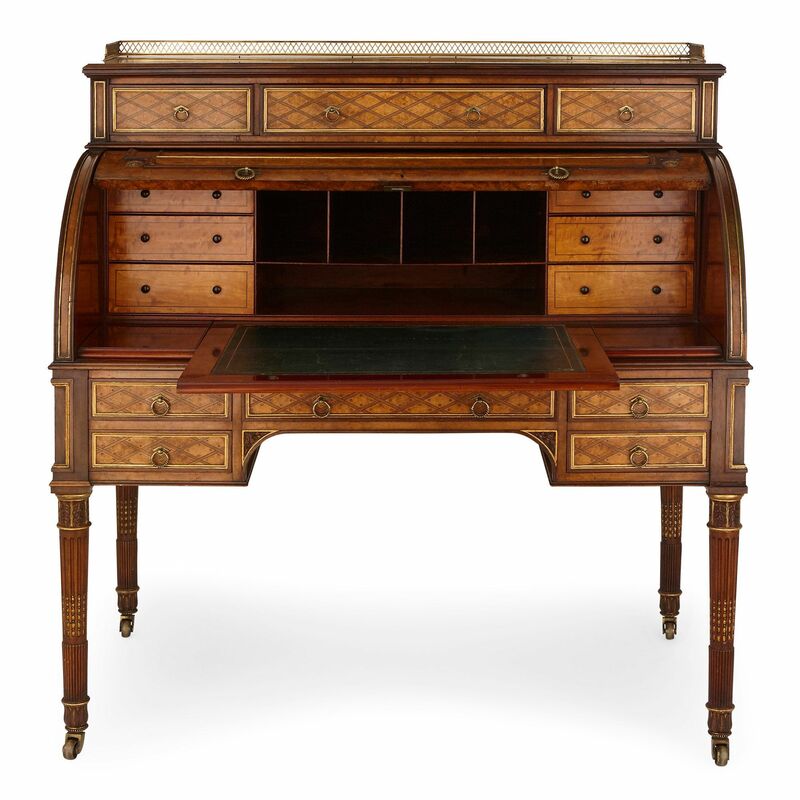 The lower section of the desk features two drawers to each side and one central drawer. There is a curved inset below the central drawer to create room for the user. 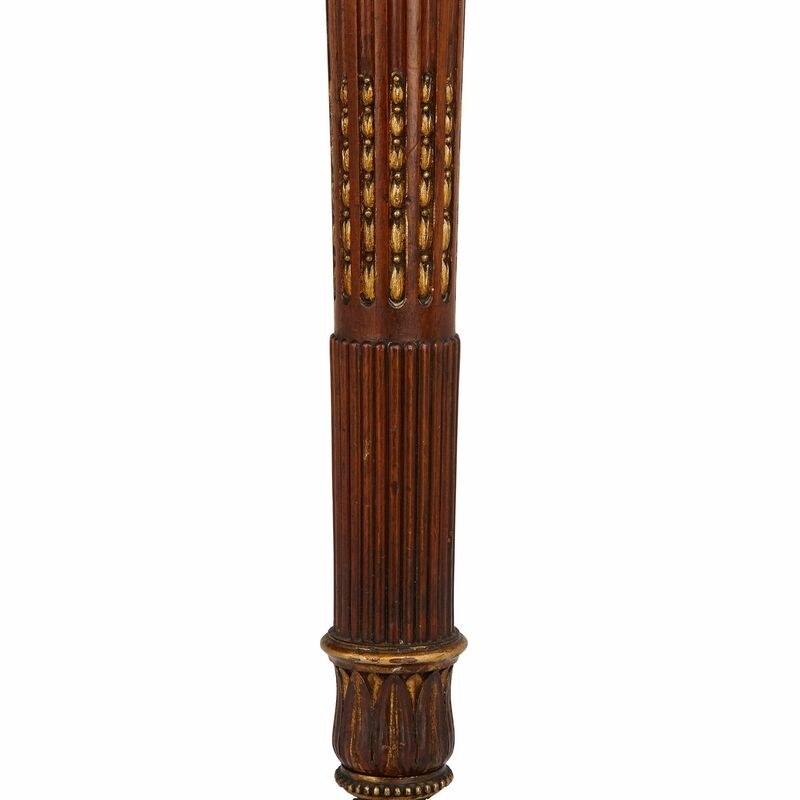 The desk is set on four, fluted legs with gilt decorations, each set upon an ormolu caster. 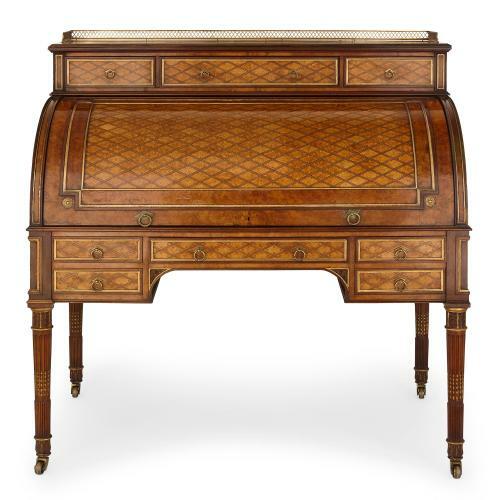 This desk is similar in style to the work of British furniture maker Donald Ross, whose work has been reproduced as tables de milieu, tables ambulantes and secretaires. A Donald Ross side table, similarly decorated with his distinctive parquetry inlay, is on display in the Victoria and Albert Museum, London (Museum number W.47-1911).